This article will break down some of the myths as well as highlight the cold hard facts about skate sharpenings and your skate sharpener. At the end of this article, you will be better informed and able to ask the right questions to the sharpener taking care of your skates! 1. How do you like your skates sharpened? 2. Do you like a lot of bite or not a lot of bite? These are only a few of the questions that your sharpener should be asking you. This is extremely important because it shows that your local pro shop cares about providing good quality service, but it also acknowledges that not all skaters are the same. It is important that your skate sharpener understands your skate preferences. Now let's go back to question #3, "what rink are you skating at?" this is something that can be crucial in picking a particular radius. Every rink is different that their refrigeration system and the temperature can play a major factor in how hard or soft the ice can be. Some might ask, what does that have to do with sharpening my skates? It is important because the softer the ice is, the more you will sink into the ice creating more friction when skating, while hard ice will have more glide. 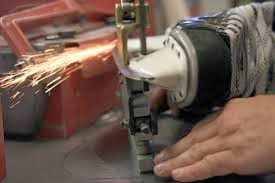 So, if a player likes his or her skates sharpened at 7/16" radius on the regular but is skating at a rink that has more humidity and is much warmer, they would probably benefit from having their skates sharpened at 1/2" radius, because it is a shallower hollow which creates less friction and less bite. Skate sharpening is an art before it is a science. Your skate sharpener should treat every pair of skates as if they were their own skates and do the best job possible. Taking their time in understanding what you like, making sure your outside edge and inside edge are completely level, having a nice slow final pass so your edges have a nice clean crisp edge so that when you hit the ice you have the least amount of friction possible. The best person to do your skates is someone who has consistently sharpened your skates the way you like them. Don't be afraid to ask some questions and tell them what you liked and disliked about the last time he sharpened your skates. Take your skate sharpening more seriously because this is where your skating starts!